You would be forgiven for turning up the thermostat a few degrees after viewing this delightfully chilling ice castle by builder Kai NRG. One can almost feel the cold and biting wind as it blows across this fortress of ice, and sense the loneliness of the soldiers who garrison it. 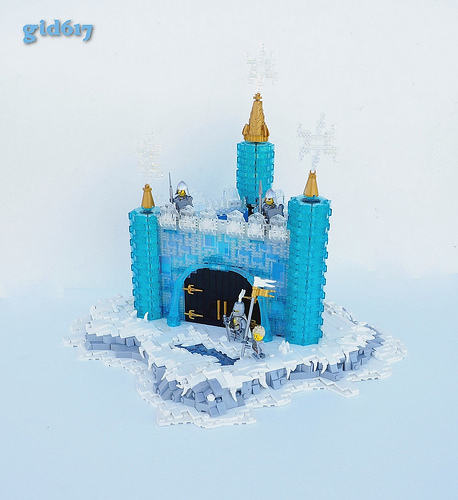 The stronghold looks to be made of an impenetrable and unwavering ice, both magical and ancient, as if its occupants were only the latest of many who once called this place home. While the castle certainly steals the show, the surrounding wasteland is no less impressive. The attention to detail is obvious in the uneven snow layers and frozen rocks which form the base. The lack of even the slightest vegetation adds to the sense of abandonment and despair in this harsh land. In such desolation there is no hope beyond the warmth of the hearth and the brotherhood of those who fight to protect this realm.